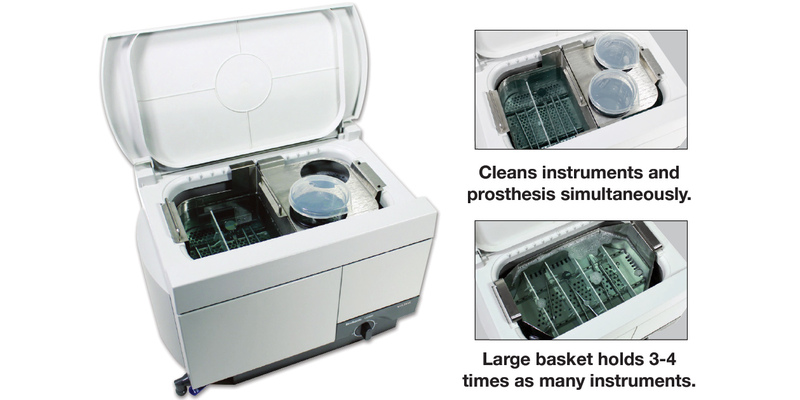 Ultrasonic cleaning system with a large 3 gallon tank capacity. Included hinged cover limits airborne contaminants and reduces noise. Benchtop model. Multiple basket and beaker arrangements. Adjustable basket dividers for instrument sorting. Accommodates most racks to fit popular cassette systems. Allows cover to stay fully open. Reduces noise levels for a quiet operation. Traps aerosols within and directs condensation back to the tank. 2 year manufacturer''s warranty from date of purchase. Overall dimensions: 19" x 12" x 12.25"
Tank dimensions: 14" x 9" x 6.75"
Includes: UC300 unit (3 gallon tank), cover, large FingerGuard instrument basket with 5 section inserts, drain tube, 1 pint BioSonic Enzymatic Ultrasonice Cleaner, 1 pint BioSonic Germicidal Cleaner.